Hi folks - We wanted to share some quick highlights from the Gourmet Food & Wine Expo with you. As a bit of an intro for those who haven't been before, the Gourmet Food & Wine Expo is held in November each year at the Metro Toronto Convention Centre. It has over 1,500 wines, spirits and beers from around the world to sample. You basically buy your entry pass, then are handed a wine sampling glass (don't break it or misplace it, or else be prepared to pay $3 for an extra - but they are so darn cute I almost wanted to buy an extra!). Then once inside, you buy a block of tickets you can use toward food and drink and you get little "sample sizes" to try for a few tickets each from whichever booths you deem interesting. We bought 20 tickets this year. 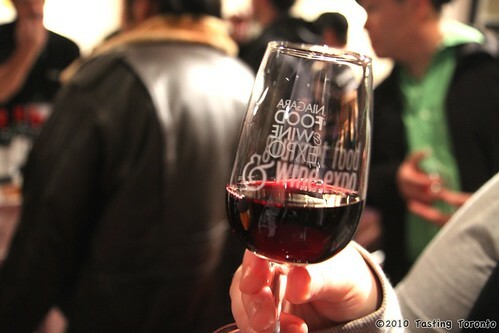 We hadn't been to GFWE in a couple years, but noticed there was a lot more wine than last time so if you're a wine lover, you'll really be enjoying yourself there! Speaking of wine, we tried a Georgian red wine that was extremely spicy (when you smelled it, it was like black pepper up your nostrils, but I'm kind of a pepper lover - Mark liked it less than I did). It was certainly interesting, and I think it was the most memorable wine I've ever had for its sheer uniqueness. In terms of ticketed food items, there were some options, but it seemed like less than last time we were there. Everything we did eat was good - we had a yummy vegetarian samosa from Magic Oven with a delicious spicy chutney drizzled over it. But of course I got drawn to DESSERT almost immediately! There was fudge on a stick dipped in chocolate from Northern Confections - what an awesome idea! It was delicious. I was sold at first glance. We also geeked out over the extensive variety of macarons from Ruelo Patisserie. Such unique flavour combinations - wasabi grapefruit, black truffle (no seriously - it was made with real black truffles! It cost more tickets than the others!) Very creative and very delicious. It's a great night out, if you live in the GTA and haven't yet been to GFWE I'd say be sure to catch it next year because it really is a fun night out, we really enjoyed ourselves.